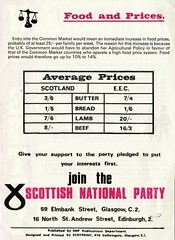 The Janey Buchan Political Song Collection arrived at the University of Glasgow in 2011 as the result of a long-term loan from the late Janey Buchan, former Glasgow Labour MEP. The collection mainly consists of material relating to the songs of socialist, libertarian, and workers’ movements from the mid 19th to the early 21st century and contains over 2500 items, including over 250 recordings on CD, vinyl, cassette, DVD, and over 750 song sheets, together with songbooks, pamphlets and a wide range of contextualising materials. An important archive of Workers’ Music Association materials is also included. 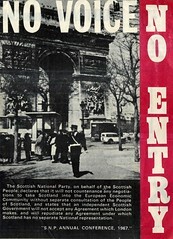 From hip hop to folk, from opera to rock; from Australia to Mexico; from songs of the Chartists to songs of the Spanish Civil War; from the anti-apartheid movement to the Occupy campaigns; from Attila the Stockbroker to the Young Communist League Choir; the Collection is an important research resource for anyone engaged with political song and songs of social justice. Following on from the lecture, Johns Powles will run a workshop. The Road to the Scottish Parliament workshop explores, through the inclusion of many songs and images, devolution and independence campaigns from 1296 to 2012. 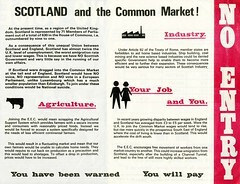 Whilst the Wars of Independence, the Union of the Crowns, the Jacobite Risings and the Act of Union are all included, the workshop concentrates especially on the 20th century with a consideration of the synergies shared by independence and devolution campaigns and activism within the Scottish tradition of political leftwing radicalism. The Battle of George Square, the reclaiming of the Stane of Scone, and even the Glesga Eskimos all have their part in the story, as do more formal events such as referendums, and the reconvening of the Scottish Parliament presided over by Queen Elizabeth 1st of Scotland. Within the general context of the workshop, nominations for Scotland’s own national anthem are also included and examined.